Brown spots on fiddle leaf fig leaves can be frustrating and confusing. It’s disheartening to see brown spots spoiling the beautiful large green leaves of your ficus lyrata. 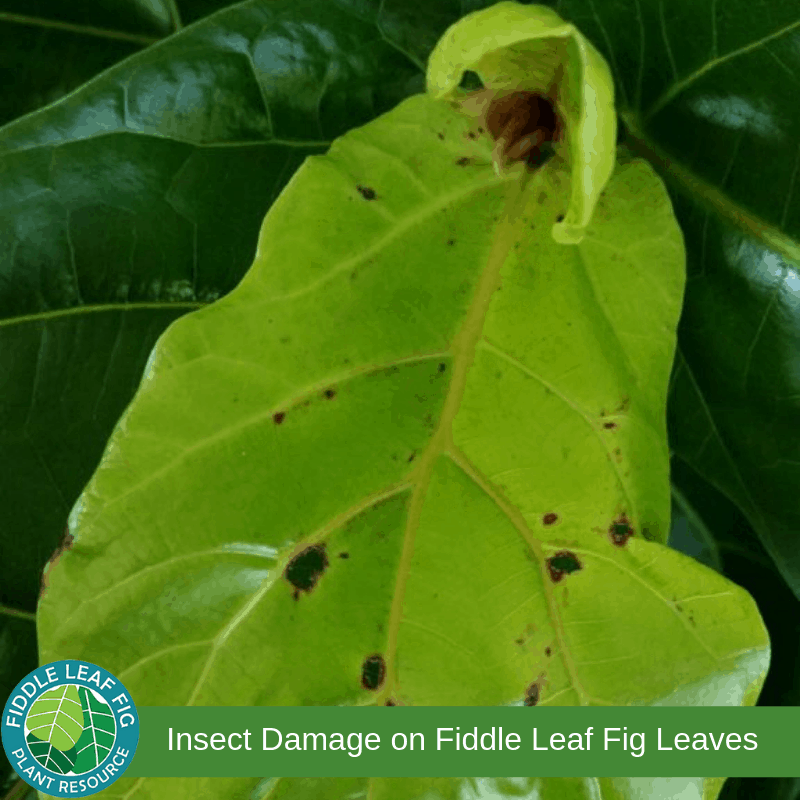 What’s worse, brown spots on fiddle leaf fig leaves can be difficult to treat if you don’t know what is causing them. There are actually four main causes of brown spots. First, you’ll need to diagnose the cause of your particular type of brown spots. Then, you’ll need to figure out how to save your plant before the damage is too great. 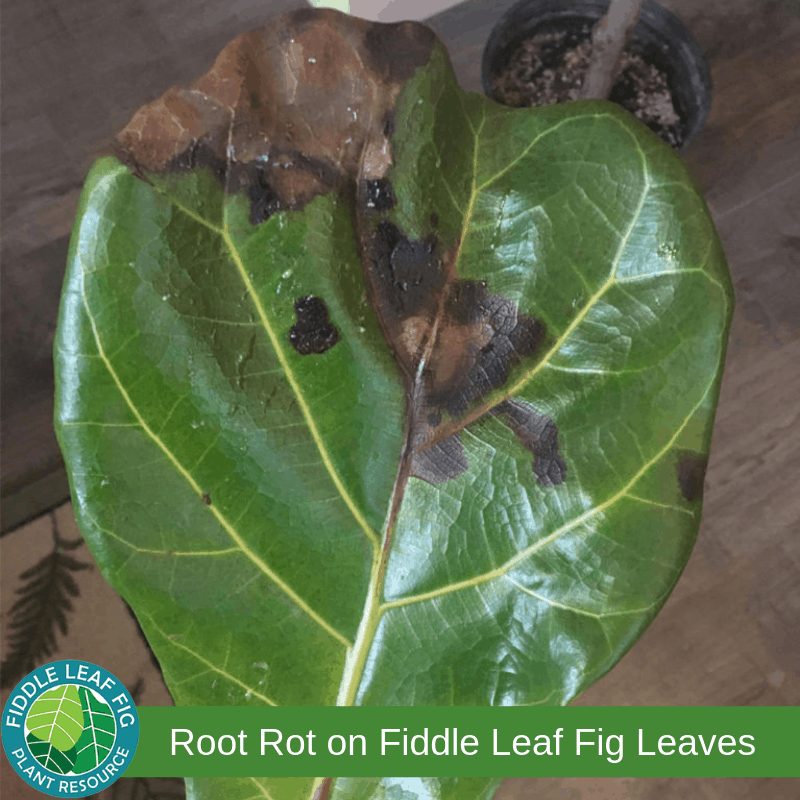 Here’s how to determine what is causing the brown spots on your fiddle leaf fig plant and how to treat them. 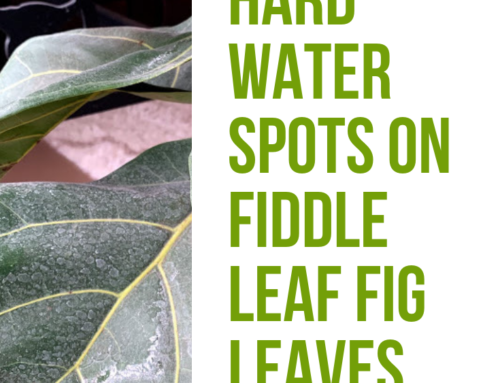 But before you get started troubleshooting brown spots on fiddle leaf fig leaves, the best way to keep your plant green and gorgeous is to take a deep dive and learn what they need to thrive. The Fiddle Leaf Fig Expert, available on Amazon now, is the ultimate top-rated guide to fiddle leaf fig care. Another great resource is The Ultimate Fiddle Leaf Fig Care Webinar, which you can watch for free here. Happy growing! What Causes Brown Spots on Fiddle Leaf Fig Leaves? Are the brown spots starting at the edge of the leaf or in the center of the leaf? Are they very dark brown (almost black) or lighter brown (more tan in color)? Are there many spots on each leaf or just one large brown area? Do the brown spots result in the leaves eventually falling off? Are they affecting older leaves near the bottom of your plant or younger new leaves near the top of your plant? The most common cause of brown leaves on a fiddle leaf fig is due to a fungal infection from the roots sitting in too much moisture. Over watering and poor drainage causes root rot, which spreads from the roots to the leaves of your plant. The roots of a fiddle leaf fig need to slightly dry out between waterings to function properly. Once the leaves are affected by the fungal infection, they will slowly turn brown and then eventually fall off. The only way to be certain that your plant has root rot is to remove the pot and inspect the roots. If the roots are brown and mushy, root rot is the culprit. You’ll need to remove the damaged roots and the leaves with brown spots then repot your plant, taking care not to over water in the future. However, you can make a diagnosis of root rot and treat your plant without repotting it. One interesting feature of root rot is that it tends to affect older leaves first, as your plant attempts to save the newer growth that is closer to valuable sunlight. If you notice more brown spots on your older growth near the bottom of the plant, root rot could be to blame. Another key symptom of root rot is leaves that are dropping. The brown spots may start as small black spots, then will get larger, until the entire leaf drops. If you think your plant has root rot, you can use a moisture meter like this one to take a moisture reading near the bottom of the roots. If your reading is very wet, root rot is likely the cause. Here you can see classic dark brown (almost black) spots from root rot that caused this leaf to drop. 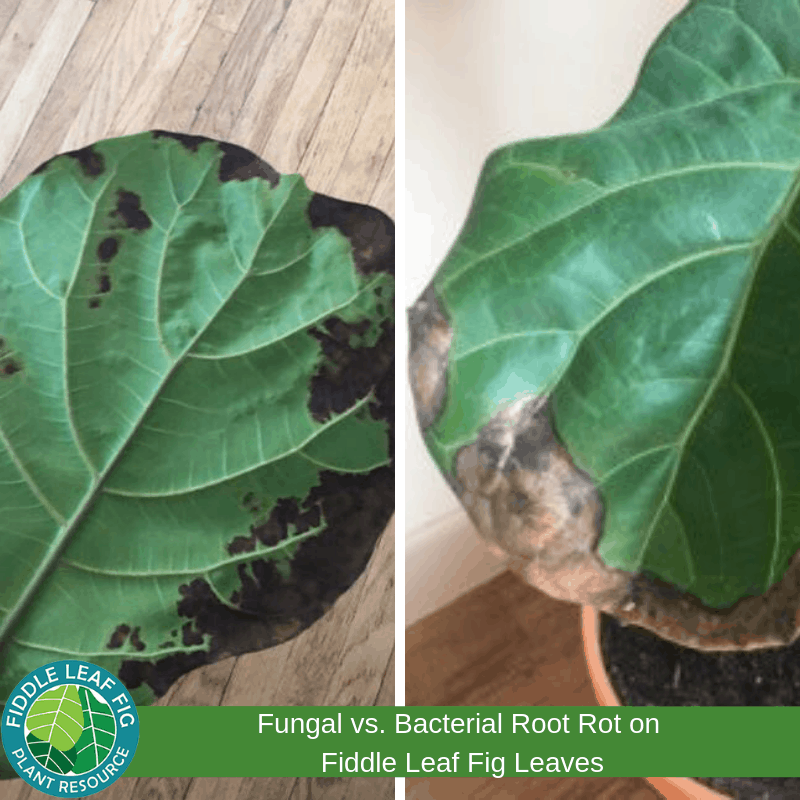 If you suspect you’ve been over watering your plant or it has poor drainage, root rot is probably the cause of your brown spots on fiddle leaf fig leaves. Not enough sunlight can make this problem worse. Too large of a pot can also cause your plant’s roots too remain to wet between waterings. Generally, root rot is very treatable, especially if you catch it early. Since root rot is generally a problem of poor drainage, you’ll want to address your drainage immediately. Make sure you have a well-draining container, fast-draining potting soil, and that you aren’t watering too frequently. The next thing you’ll want to do is assess the damage. If there are just a few brown spots on the leaves, you do not need to repot your plant. Let your plant dry out for two weeks or more until the roots have adequate time to recover. Remove the affected leaves and make sure your plant has enough sunlight. If you’re not sure whether your plant has wet roots, you can use a moisture meter to make sure the roots are drying out between waterings. Then, your plant should recover with proper drainage and watering. Take a look at our Ultimate Guide to Watering Your Fiddle Leaf Fig here to learn more about proper watering. However, if the damage is severe or spreading rapidly, you’ll want to perform root surgery and repot your fiddle leaf fig. Remove your plant from its pot and hose down the root ball. Cut away any brown, mushy roots. Make sure you have proper drainage and repot with fast draining house plant soil. Follow good watering practices in the future to make sure the problem doesn’t recur. Bacterial infections can be some of the most stubborn and frustrating problems to fight. If your plant has some of the symptoms of root rot, but doesn’t respond to treatments, a bacterial infection may be to blame. This is unfortunately very common in plants purchased from big box stores. One key characteristic of bacterial brown spots is they are less black and more brown in color. Bacterial leaf spot will attack all areas of a plant, including older larger leaves, but especially young new leaves. If you see small leaves with stunted growth, yellowing, and brown spots, consider a bacterial problem. Bacteria can also cause many brown spots per leaf, not just one large brown area. The bacterial spots have irregular margins and can occur anywhere on the leaf, including near the edge of the leaf or where the leaf meets the stem. Bacterial leaf spot actually prefers feeding on new growth, so if your newer leaves are worse off than your older leaves, bacterial leaf spot is likely to blame. 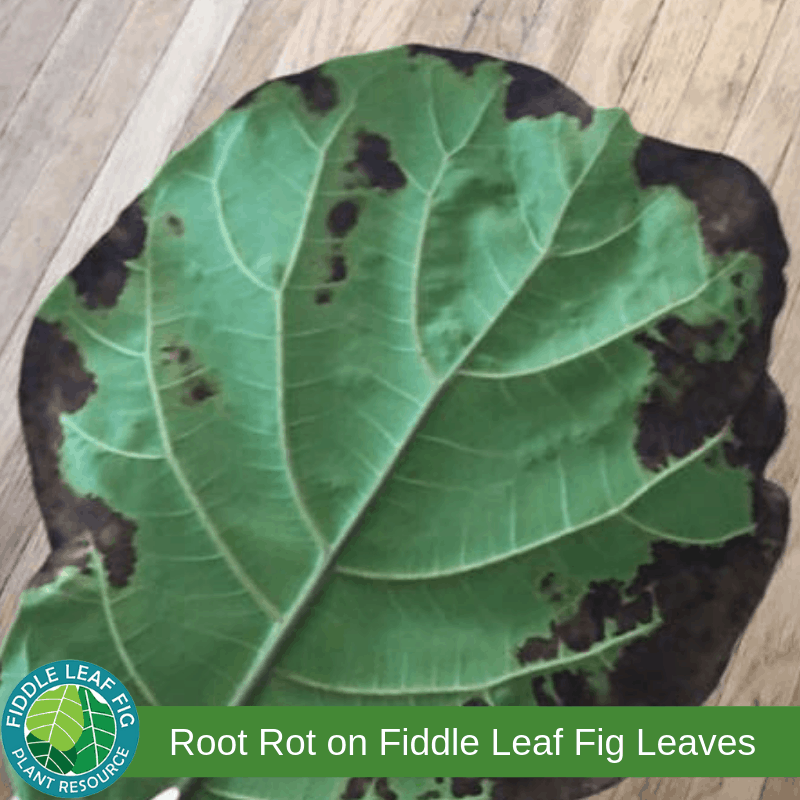 Another telltale sign of bacterial leaf spot in your fiddle leaf fig is a yellowing of the leaves in addition to the brown spots. With root rot, the leaves will typically remain dark green with dark brown spots, but with bacterial leaf spot, the leaf will turn yellow as the brown spot spreads. Both root rot and bacterial leaf spot will cause your leaves to eventually fall off. Classic bacterial leaf spot on a fiddle leaf fig, with multiple spots throughout each leaf. Here you can see the bacterial infection is attacking new growth and causing smaller leaves to stop growing. If you are a pretty experienced plant owner and are confident you’re not overwatering, a bacterial infection may be your problem. They’re very tricky to overcome, even with proper care. 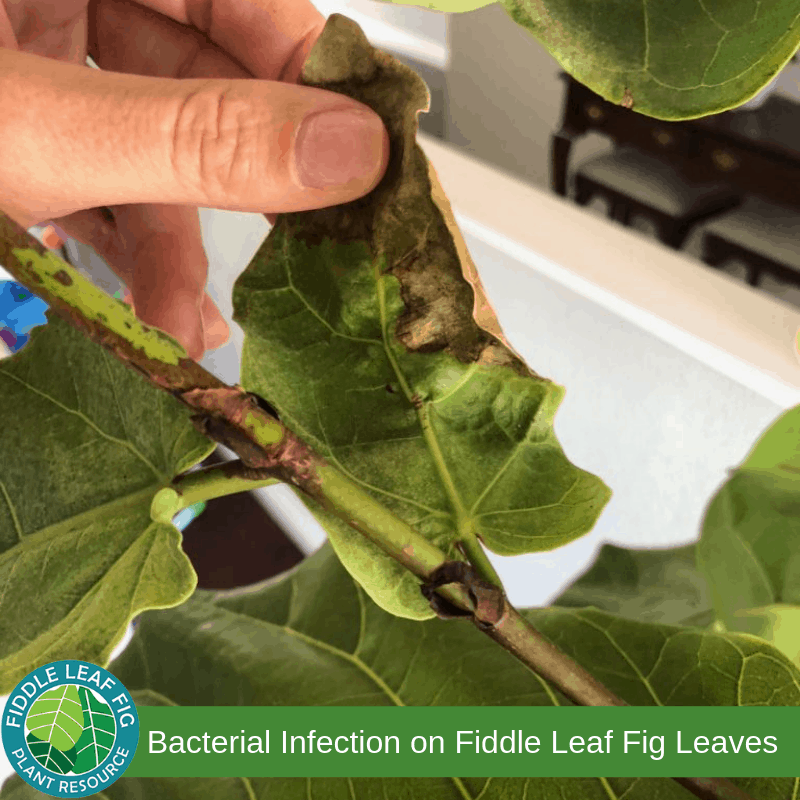 If you’ve tried everything and your fiddle leaf fig still has brown spots throughout the plant and is dropping leaves, this is likely the cause. If you purchased your plant at a big box store, bacterial infections are more common. Unfortunately, this is of one of the hardest conditions to treat in a fiddle leaf fig. The key is to treat the spots as early as you can before the damage spreads too far. 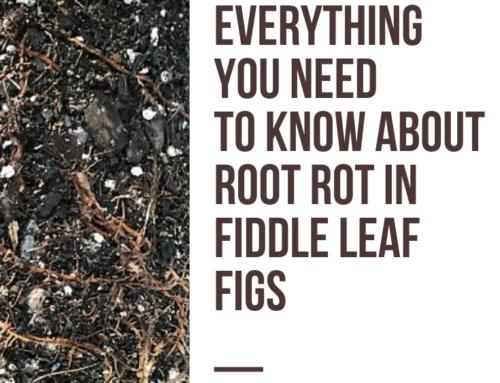 The treatment is similar to treating root rot, you’ll want to make sure your plant’s roots dry out between waterings and that it’s getting plenty of sun. If the damage is not severe, cut off all of the leaves with brown spots and repot your plant with fresh, sterile soil in a container with good drainage. Give it plenty of light and go easy on watering until it recovers. 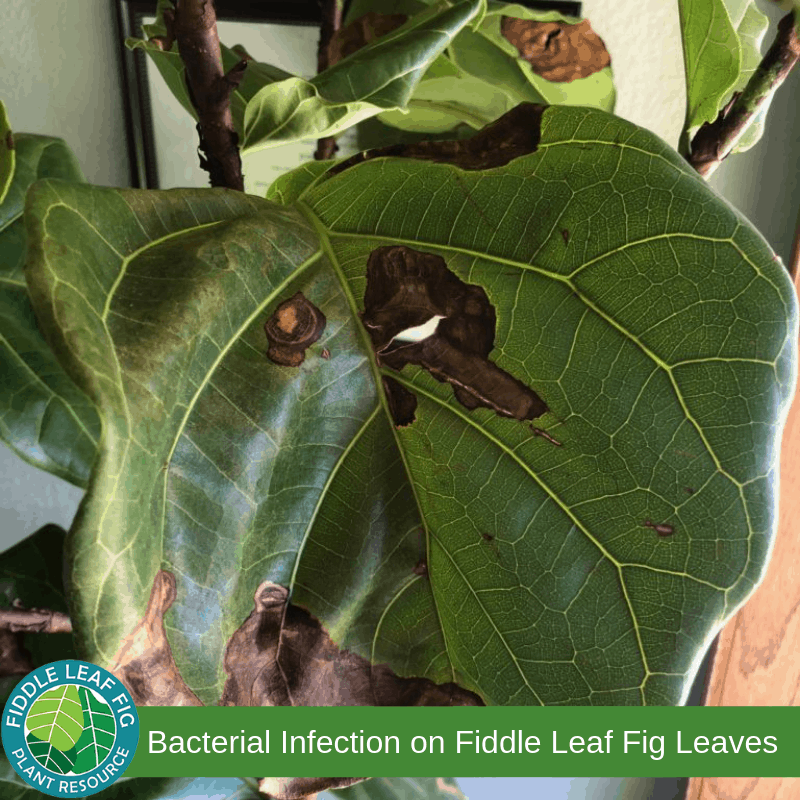 One good way to treat bacterial infections is to put your fiddle leaf fig outside in the shade to recover, depending on your climate. Fresh air, plenty of sunlight, and warm conditions can help your plant recover. Just be sure that your plant is protected from direct sunlight and doesn’t get too cold (less than 50 degrees) or too hot (greater than 95 degrees). However, if your plant has more than 50% of the leaves affected by brown spots and the condition is spreading, you may be better off starting over. Discard the plant and start fresh with a healthy specimen. You may want to contact the store where you purchased your plant to see if they’ll replace it. Two classic examples of fungal vs. bacterial root rot. The fungal is the black circular dots and the bacterial is the brown that do not have as much of a circular pattern but more of a spreading pattern. 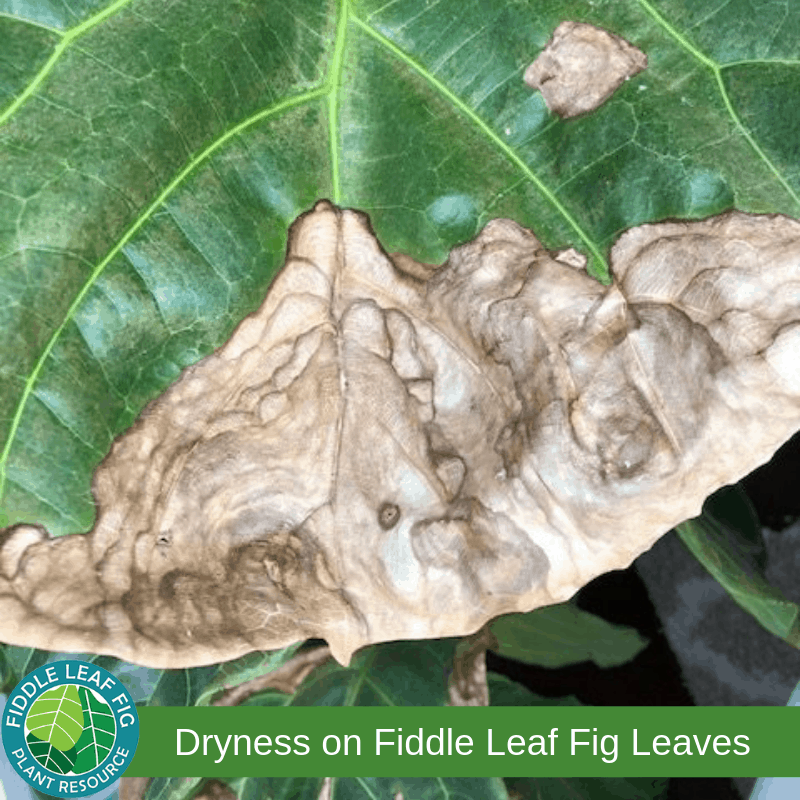 Dry plant brown spots are somewhat easier to diagnose, as they will have dry tan or lighter brown areas that start at the edge of the leaf and cause the leaf to curl. Your plant will overall look wilted or dry at times and the soil may have receded from the pot (shrinkage). This can cause the water to run between the pot and the soil and never reach the root ball. If you’ve forgotten to water your plant on a regular basis or if it’s in a very dry environment, brown spots may occur. The relative humidity for your plant should be between 30 and 65 percent, so if your home humidity is much lower or your plant is near a heater, you may need to create more humidity for your fiddle leaf fig by misting or changing locations. 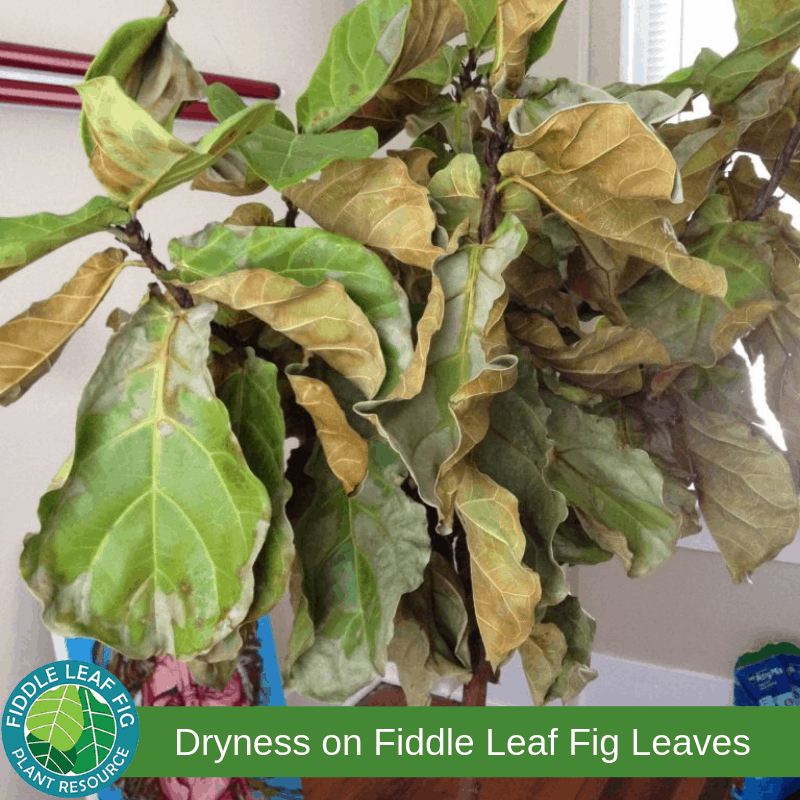 Symptoms of dryness on a fiddle leaf fig tree. If you know you’ve missed a few waterings or your plant was in very hot conditions and your plant looks dried out, lack of water is probably the cause of your brown spots. Soil shrinkage is a dead giveaway of dryness. If you notice soil shrinkage, you’ll want to repot your plant to make sure your root ball is getting adequate water. If your fiddle leaf fig is in a very dry environment or near a heater, consider moving it to another location. Water regularly (try once a week) and monitor your plant to make sure it’s getting enough moisture. You can try misting every one to three days or using a humidifier near your plant if your home is very dry, though this is not typically necessary unless a heater is running near your plant. 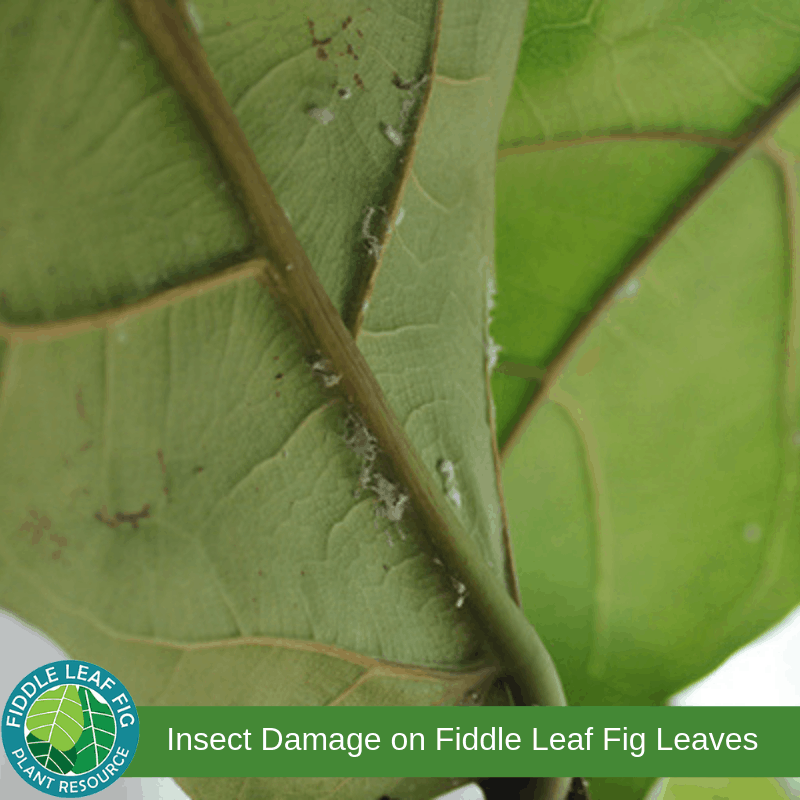 Insect damage in a fiddle leaf fig plant is thankfully less common. The giveaway to diagnose insect damage is small dark spots that damage the plant leaves that turn into holes in the leaves. The happens more commonly in the new, tender growth. You can also look out for any insects on your plant (use a magnifying glass) or any white or gray insect webs. If you find any evidence of insects living on your plant, you’ll know this is the cause of your brown spots. Insect damage can start as very small black or reddish spots that turn to holes. Evidence of mealy bug infestation on fiddle leaf fig plant. Insect infections are rare but leave obvious clues. Use a magnifying glass to look for webs or insects on your plant. Insect infestations are easy to treat. Use a neem oil product designed for houseplants. Take your plant outside if possible, as the neem oil has an unpleasant smell that lingers. 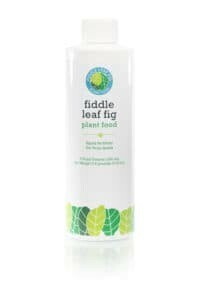 Spray all of the leaves of your fiddle leaf fig thoroughly. Turn each leaf to spray the underside and don’t forget where the leaf meets the stem. Wait two weeks, inspect again, then repeat the spraying process if needed. Now that you’ve diagnosed the cause of your fiddle leaf fig plant’s brown spots and you have a plan for treatment, you’ll want to make sure you keep your plant healthy in the future. Make sure your plant has proper drainage, follow watering best practices, and make sure to fertilize with Fiddle Leaf Fig Plant Food each time you water to keep your plant strong. Are you still confused? Check out our ultimate photo identification guide for brown spots on a fiddle leaf fig here! 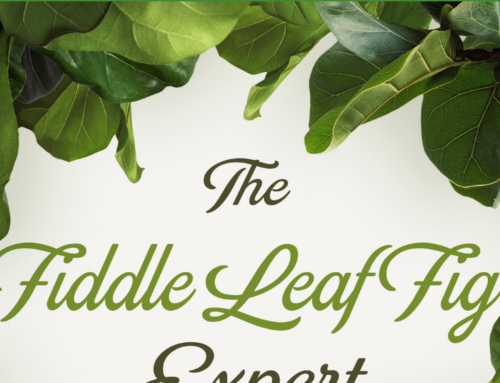 Another great resource is The Ultimate Fiddle Leaf Fig Care Webinar, which you can watch for free here. 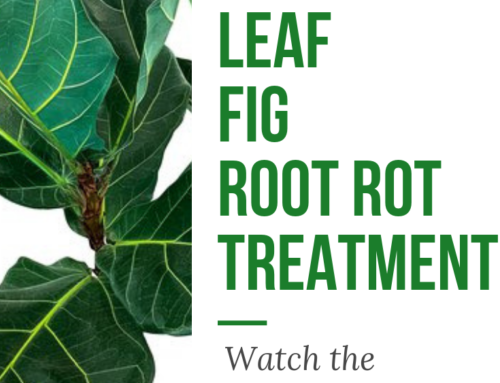 Check out the post about How to Treat and Prevent Root Rot in Fiddle Leaf Fig Trees. This post also includes a helpful video. 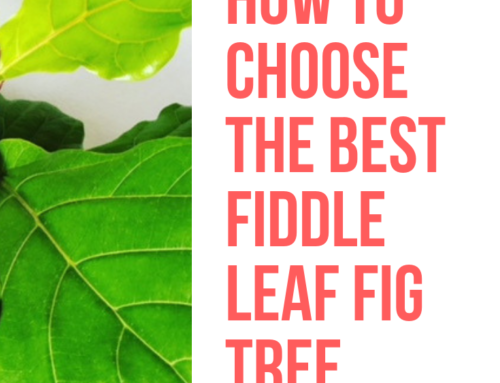 For more information, join the Fiddle Leaf Fig Club, download the Ultimate Guide to Watering Your Fiddle Leaf Fig, and ask the Fiddle Leaf Fig Doctor a question! 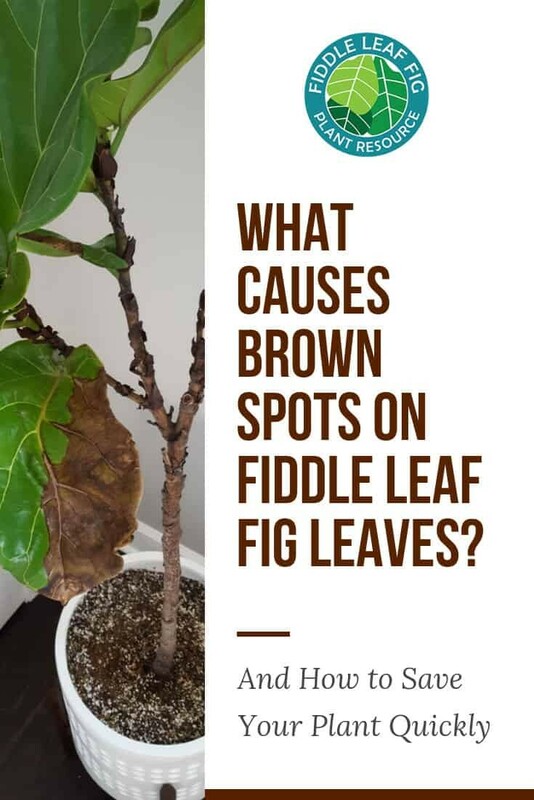 To ask questions about your brown spots on fiddle leaf fig leaves and share your plant’s story, click to join our community on Facebook: Fiddle Leaf Fig Plant Resource Group. Hi my fiddle leaf fig as a bunch of tiny brown dots all over some of its new growth leaves. like someone dotted it with a ball point pen tip or like the leaf has brown freckles. Any ideas what that could be from? This is pretty common with insects, have you tried spraying with neem oil?